Chief of health care reform Lawrence Miller and director of health care reform Robin Lunge watch as Gov. Peter Shumlin speaks at a news conference Monday. "I'm delighted with these numbers," Gov. Peter Shumlin said Monday at a news conference to trumpet the results of the Vermont Household Health Insurance Survey. He attributed much of the reduction to provisions of the federal Affordable Care Act, which Vermont implemented using its online health-insurance marketplace — Vermont Health Connect. 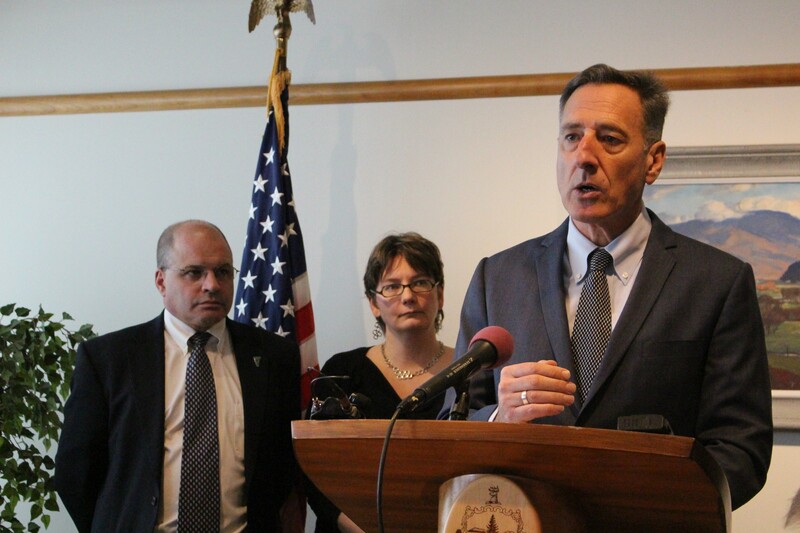 Vermont Health Connect — the vehicle for signing up for insurance — struggled, but Shumlin said the underlying policies it implemented helped more Vermonters gain coverage for their health expenses. The Affordable Care Act expanded who was eligible for Medicaid and provided subsidies to help more people afford private insurance. "With all the pains and struggle, it is clear that Medicaid expansion and the Affordable Care Act are benefiting Vermonters," Shumlin said. Shumlin noted that the growth in the number of Vermonters on Medicaid has consequences. It means more medical coverage is paid at Medicaid's lower rates, shifting costs onto private insurance. Shumlin said he hopes to offer a remedy for this longstanding problem as part of a health care package he will announce as the legislative session opens. The extensive survey asks respondents not only if they have insurance, but what kind and how satisfied they are with their coverage. For the first time, the survey also asked respondents about their familiarity with health insurance terms. All the buzz about health care in recent years, especially concerning Obamacare, may have contributed to the high level of health-insurance literacy that the new survey found. "Nearly all residents are confident they understand premiums, deductible, and co-pays while 55 percent are confident they understand the term 'health exchange,'" the report states. The 119-page report contains dozens of tidbits ripe for further analysis. The percentage of Vermonters with private (nongovernmental) insurance continues to decline. The new figure is 54.4 percent, down from 56.8 percent two years ago and 60.1 percent in 2000. The percentage of Vermonters on Medicaid increased 3 percent in two years, to 21.1 percent from 17.9. The percentage of uninsured dropped from a high of 9.8 percent in 2005 to 3.7 percent in the new survey. The 25-to-34 age bracket has the highest percentage of uninsured — 11 percent. The number of uninsured is highest for Vermonters age 25-34 and 45-64 and lowest among children and seniors. The 35-44 bracket has about half the number of uninsured as the age groups on either side. Northeastern counties plus Windham have the highest rates of uninsured. Two-thirds of uninsured children are female. Two-thirds of uninsured adults are male. Of uninsured adults, 79.4 percent are employed and 76.1 of them have full-time jobs. Fewer uninsured adults said they had trouble paying their medical bills than in previous surveys — 35.6 percent compared to 40.3 percent two years ago and 46.1 percent in 2008. While 53.7 percent of households with one uninsured member voiced interest in enrolling in a state health insurance program, only a quarter of the uninsured said they were likely to apply for Medicaid. And 45 percent said they were not at all likely to apply for Medicaid. Many of the uninsured — 77 percent — don't have access to insurance through work.